While conducting research on how to treat her arthritis, an autoimmune disorder, Jay and his wife discovered research that showed eating grass-raised meats and milk, which has a better Omega 3/Omega 6 ratio than corn-fed beef as well as high levels of Conjugated Linoleic Acid (CLA), could actually reduce inflammation, prevent chronic diseases including heart disease and arthritis, lower LDL cholesterol and help reduce body fat mass. The problem the couple found, though, in trying to change the way they bought meat, was that there were few grassfed beef options, and those they did find were expensive and inconsistent. “I grew up on a cattle farm,” says Shipman, “and I wasn’t excited.” This time Jay had personal ownership on raising quality, healthy, grassfed beef to bring to the market—his ideas had changed about what he fed himself, and his burgeoning family. That’s when Jay went back to his college buddy Jack, whose family had been in ranching for a century. Together they became J&J Grassfed Beef. I first met Jay last summer at the Culver City farmers’ market. I was immediately drawn to the stall, which was sparse, except for a handful of pamphlets, a pristine boxy white freezer, and a young man with wavy, dark blond hair. Jay had the quiet calm of a cowboy and the affable nature of a San Diego surfer, and he talked about the meat in that freezer with pride. It was easy to get excited about all the buzzwords (I had just finished reading Omnivore’s Dilemma, after all): Local, grassfed, no hormones or antibiotics. I brought home a pound of ground beef and made some burgers, and I was hooked. These days J&J is a real family affair. Jay’s dad, a longtime farmer, helps out on the ranch, and his brother-in-law, Abe, and his wife both help sell the meat at farmers’ markets around the Southland. J&J has two herds of cattle, one that grazes up in Northern California on one of Jack’s ranches, and the other that munches on a mix of grasses down in the Imperial Valley, near the Mexico border. They don’t use specific breeds—their cows are all angus-based, but crossed with other breeds like Charolais and Hereford. They’re moved around the range weekly the old-fashioned way—by horse—and build muscle by eating legumes like alfalfa, which is high in protein, and rye grasses, which is good for the cows’ rumen and full of energy. As the cows move, they fertilize the grasses, making the use of synthetic fertilizers virtually unnecessary. And the grasses they eat are never treated with herbicides or pesticides. This style of ranching, says Jay, eliminates the need for petroleum-based tractors and harvesters and the gasoline that it takes to haul grain all over the place. By pasture raising and finishing the cows, the sun grows the grass, and the cows harvest it. If their commitment to a natural product weren’t enough, J&J decided to work with a small, local processor, which only runs through about 10-15 animals a week. This helps ensure that the animals are humanely processed and that the beef you’re getting is pure J&J, too. J&J’s beef is then dry-aged, from 10-14 days if it comes form Northern California, and for at least 21 days if it comes from Southern California. And the taste is superlative. Unlike a lot of grassfed beef I’ve found at specialty markets, the meat has great texture and a natural earthy undertone that’s apparent but not overwhelming. It tastes like beef. And it cooks beautifully. J&J is at the Culver City Farmers’ Market every Tuesday, and they start this Sunday at the Atwater Village Farmers’ Market, every other week, until business picks up. You can also find them at Santa Monica on Saturdays, or join one of their CSAs, which they’ll tailor to your family size and meat consumption. If all goes well, maybe we’ll see them at the Hollywood Farmers’ Market soon, too, perhaps with a little nudging of the organizers on the corner of Selma and Ivar. 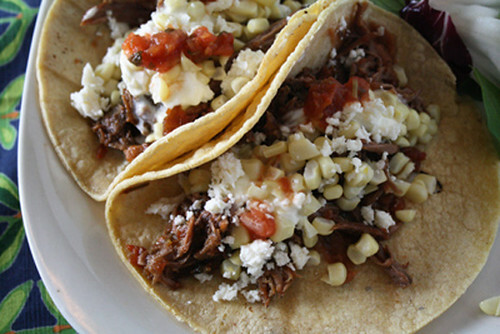 Until then, enjoy this super-easy (and very tasty, might I add) recipe for taco meat using a cross-rib roast from J&J. This 1.25 pound roast cost me just $6.90 and fed Neal and I a complete dinner with leftovers for a couple of lunches, too. Make your own tortillas and salsa and you’re talking a yummy, kid-friendly, healthy meal for the family for under $10! Place Roast in a crock pot and add ¾-jar of salsa and beef broth. Let simmer for 5-8 hours depending on your schedule. If needed add a little water to keep meat moist. Shred the meat and serve over salad or with tortillas and taco makings for a quick taco/burrito night! Note: If you don’t have a crock pot, don’t despair! I made the tacos pictured above in my Dutch oven. I seared the beef in a little olive oil first, to create a nice brown crust, and then added the salsa and broth. I cooked, covered, at 275 degrees for about 2 ½ hours and the meat was just falling apart. Moist and delicious, these were some of the best tacos we’ve enjoyed in ages. And we love tacos. We topped ours with fresh corn, more salsa, a little crème fraiche and refried beans. That’s fantastic. I usually go to the Hollywood Farmers Market, but I may have to head over to Atwater Village this Sunday. And I can’t believe how easy those tacos are! I am so adding these guys to my next artisan steak tasting in LA, great story, Leah. BTW, I made your braised winter beef the other day and savored it for three days running as part of Kim O’Donnel’s Eat Down the Fridge challenge. Delicious. Yeah! Glad you enjoyed the recipe, Carrie. And I’m glad you like the story. Innovative.I am sure I will enjoy the receipe !If it is good for health,what prevents it from eating ? whoah! just saw ’em at the Saturday Santa Monica Farmers Market. informative write up but… not sure these will ever make it to the $1 taco stands in East LA. Not likely, Sino. Nothing quite compares to a good ELA taco, does it?